Listen to what hearing aids sound like in the real world. Listening to "beeps" is no way to find out how your hearing instrument will sound when you're out on the beach with the kids. Yet that's all you can expect from most in-office hearing tests and fittings. Beltone has a better way. It's called Beltone AVE. We've replaced the beeps with birds and other sounds from real life. Beltone AVE. is not a hearing test. It's more like a test drive. It's a revolutionary way to fit hearing instruments, and only Beltone has it. Beltone AVE. uses the latest technology to create highly accurate virtual sound environments with Dolby TM Pro- Logic recordings and a multi-media speaker system. 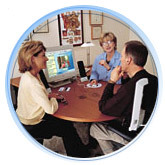 It is truly one of the most advanced patient-focused fitting systems available today. It's also a great way for you and your loved ones to find out what type of hearing help you really need. With Beltone AVE., your Beltone hearing aid specialist or audiologist can choose and adjust your hearing aid in the same types of situations where you'll use your hearing aid. Before you leave our office, you'll know what your hearing aid will sound like in the real world.